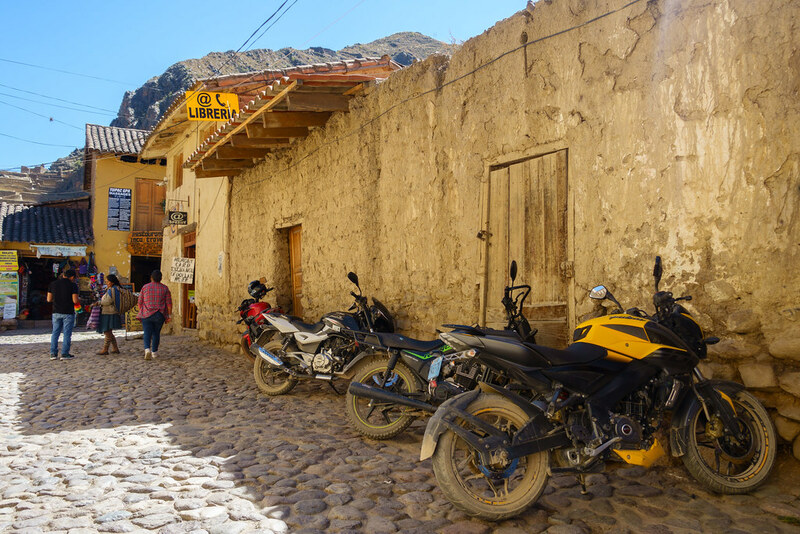 Post 4 of a series detailing our trip around South America. View the series so far here. 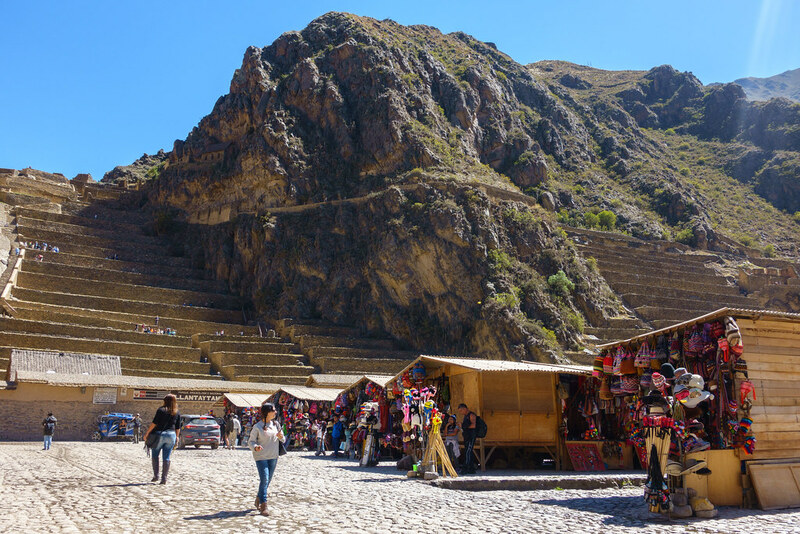 We made a brief stop in Ollantaytambo on the way back to Cusco from Aguas Calientes/Machu Picchu, and it was so worth it. 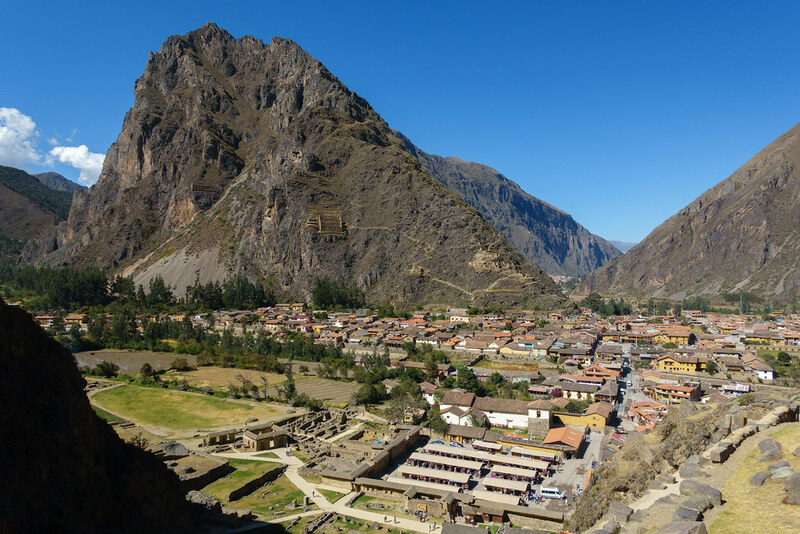 ‘Ollanta’, as it’s called for short, is one of the most picturesque and interesting towns I’ve ever visited. 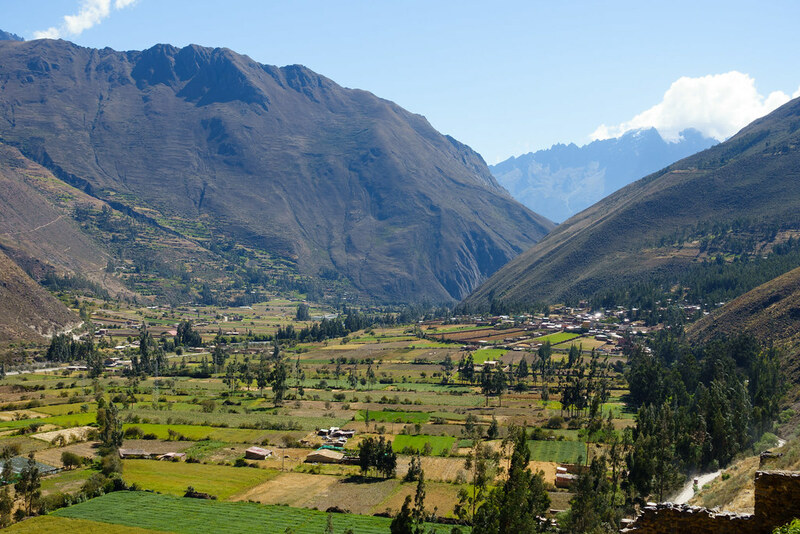 It’s best known for its extensive Incan ruins but has plenty more to offer besides, including a hipster cafe or two. 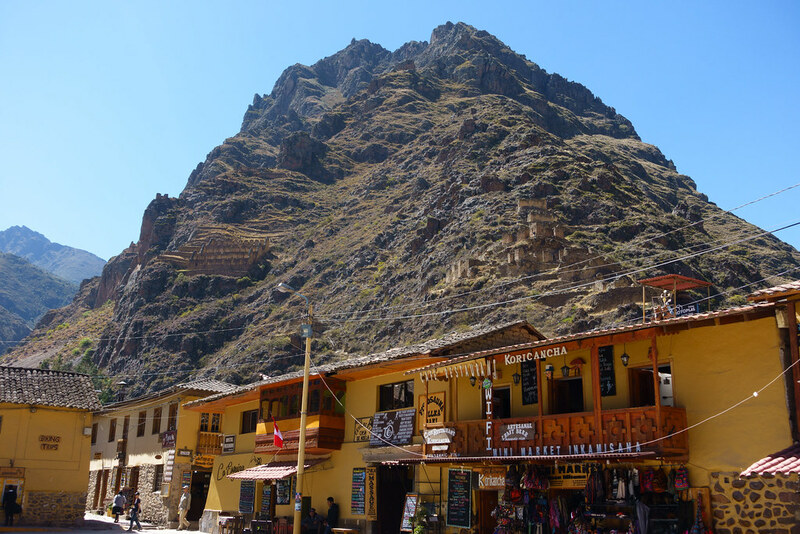 We caught Inca Rail’s economy ‘Voyager’ train to Ollantaytambo and found it very comfortable, with a snack and a drink included (see my Machu Picchu post for details of the trains). 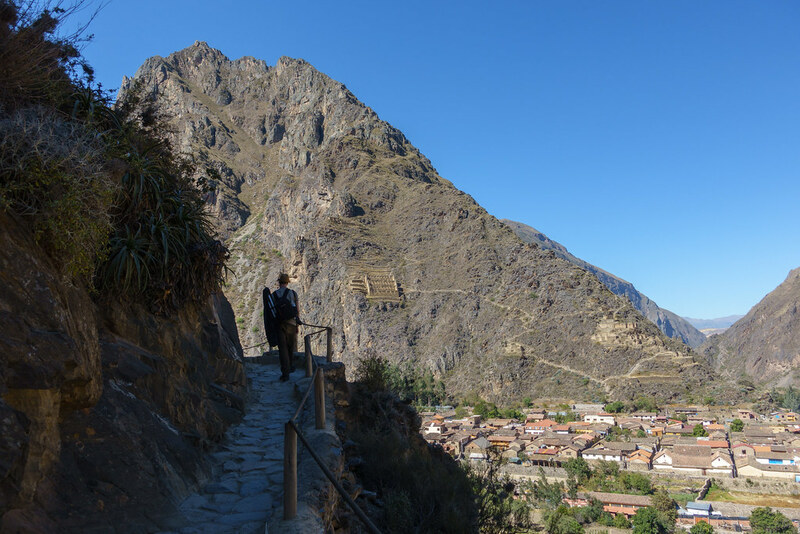 Arriving into Ollantaytambo at around 10.15am, we spent around an hour just wandering. Both Steve and I fell in love with Ollanta. 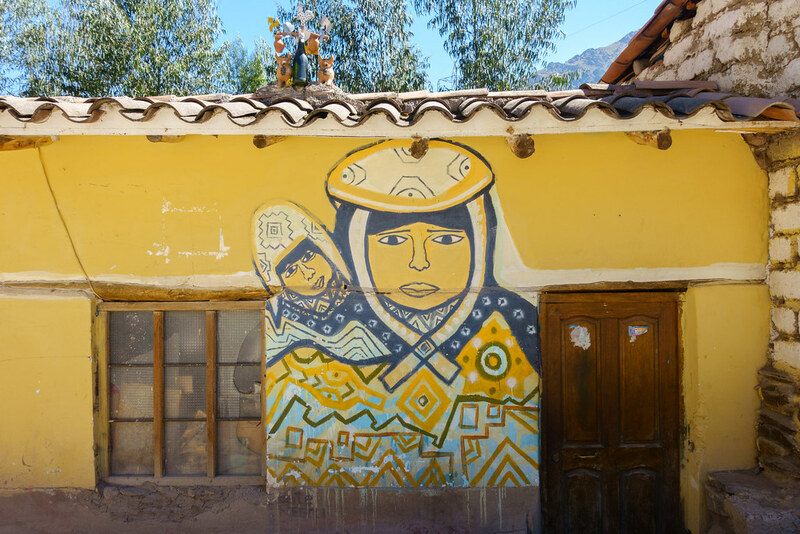 With its cobbled streets, sandy buildings and bursts of colour – all set against a stunning mountainous backdrop – Ollantaytambo is unquestionably charming. 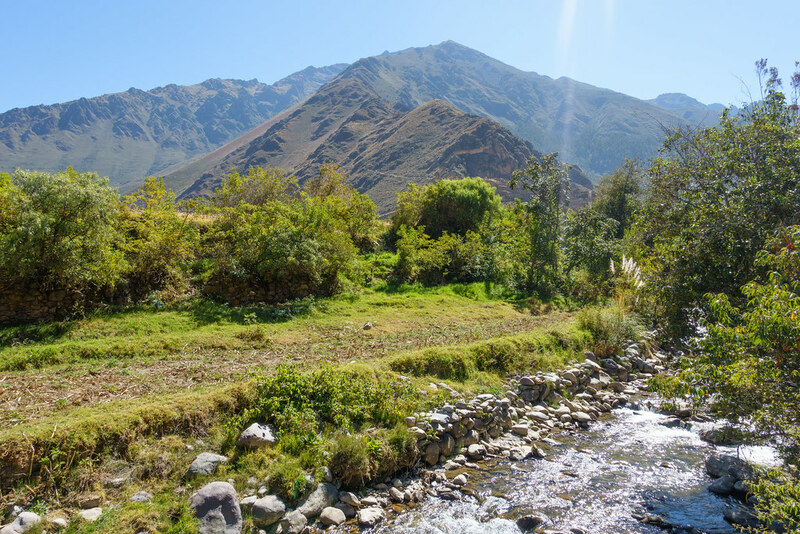 It’s also noticeably quiet and laidback in comparision to somewhere like Cusco, where we found you couldn’t walk for five minutes without being harassed somehow. 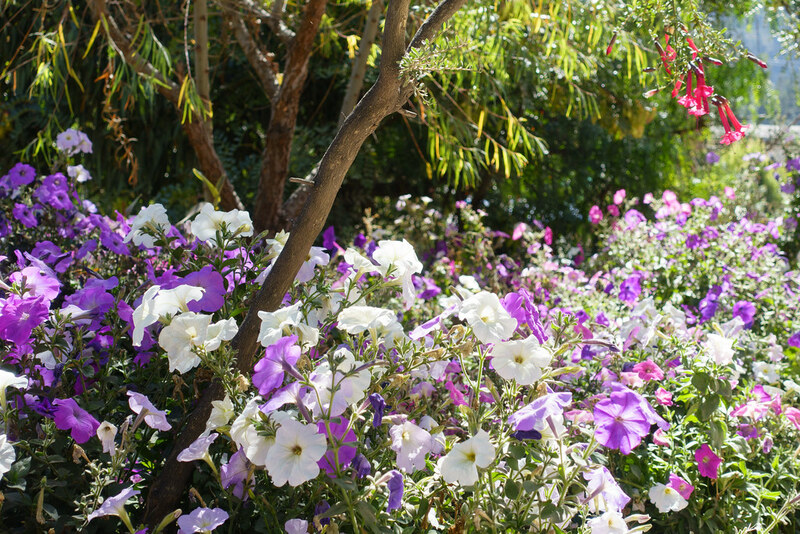 You’re met with attractive sights as soon as you arrive. 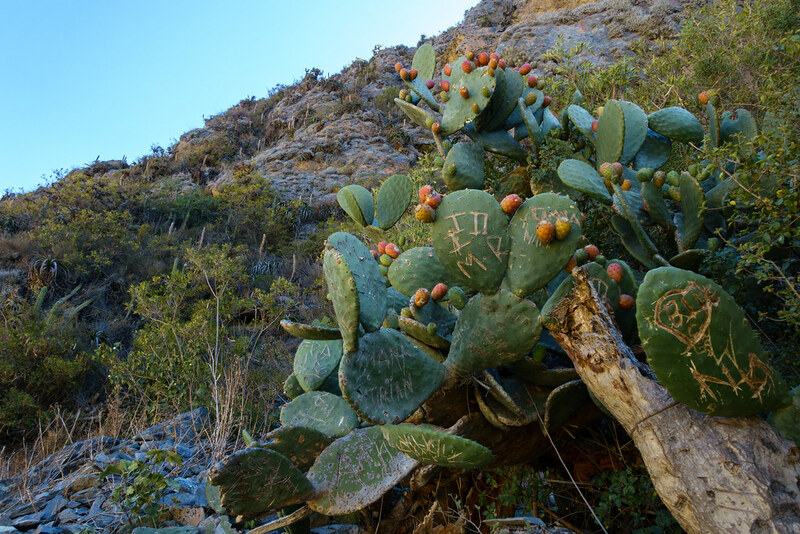 The road from the train station into the centre goes along a stone-filled stream bordered by flowers and cacti, which looked beautiful in the sun. 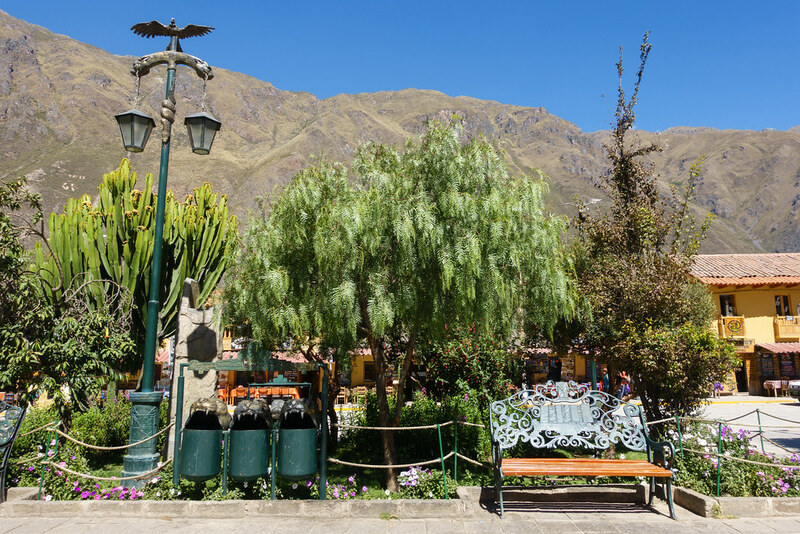 At the top of this road you can either turn left to go to the market square that backs onto the Incan ruins, known as Temple Hill or the Fortress, or right to go to the pretty central plaza which has a garden, shops and restaurants. We got a lot of enjoyment out of simply walking around the rustic streets and colourful markets, photographing whatever drew our eyes. 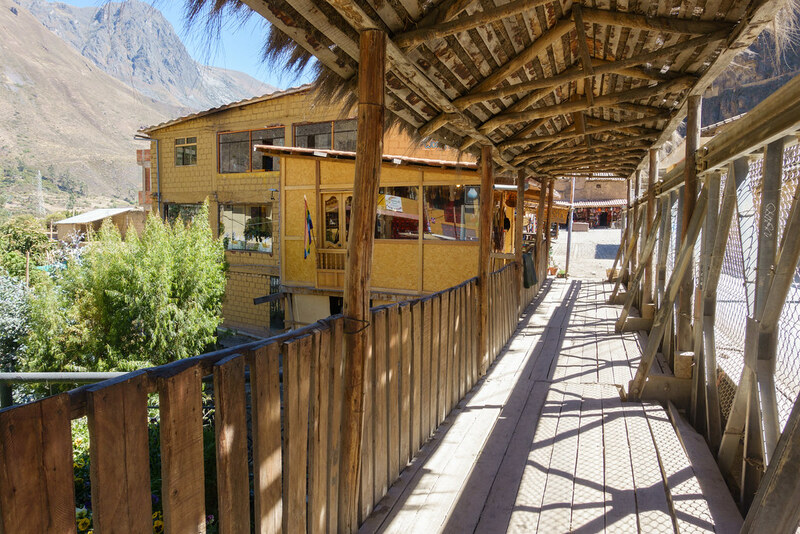 Even next to a large Incan ruins site within Peru’s Sacred Valley, we managed to stumble upon a hipster cafe ran by an English-speaking expat. This wasn’t intentional – we just really liked the sound of the food on the menu displayed outside. 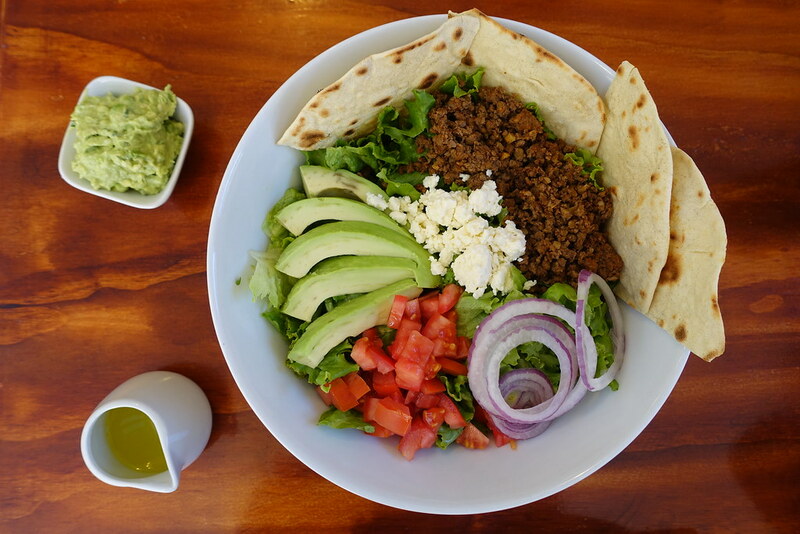 Sunshine Cafe was the perfect place for an early lunch, offering an array of healthy and well-priced breakfast and lunch dishes. 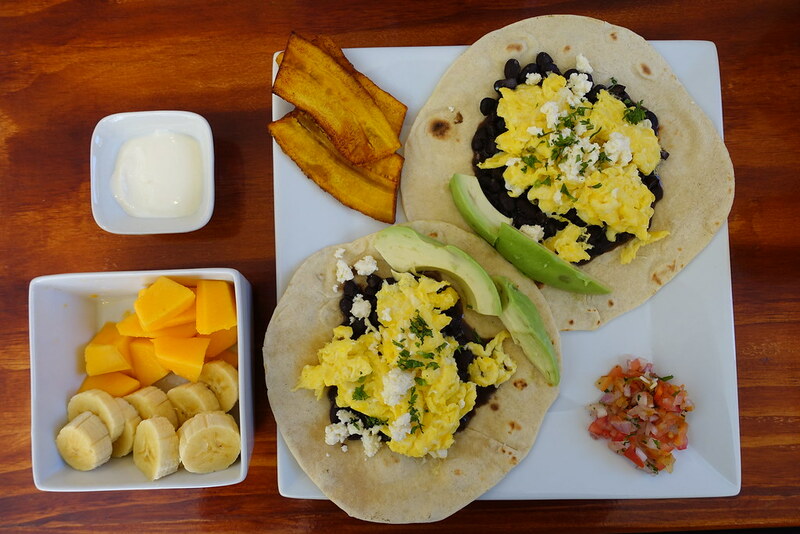 I had breakfast tacos, Steve had the giant taco salad, and we both ordered freshly squeezed fruit juices. Everything tasted fresh and delicious, particularly in contrast to the heavier food we’d been eating elsewhere. Everything came to 48 soles (around £20). Our healthy lunch was just what we needed to tackle the steep climb up the Temple Hill/Fortress ruins. 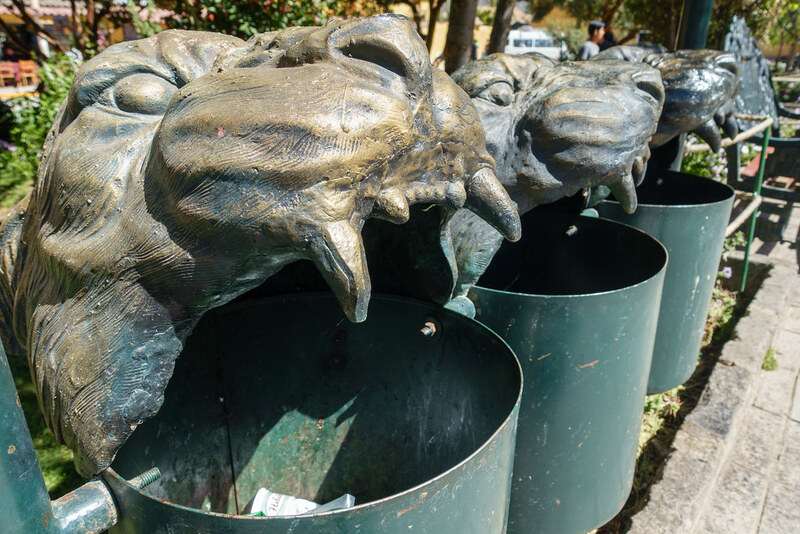 We paid 70 soles each for the partial turisto boleto (this gets you into four different touristic sites, but unfortunately we didn’t have time to see the others). Climbing the hill was a struggle, particularly at this altitude, but it was worth the effort for the amazing views over the town and the surrounding fields and mountains. 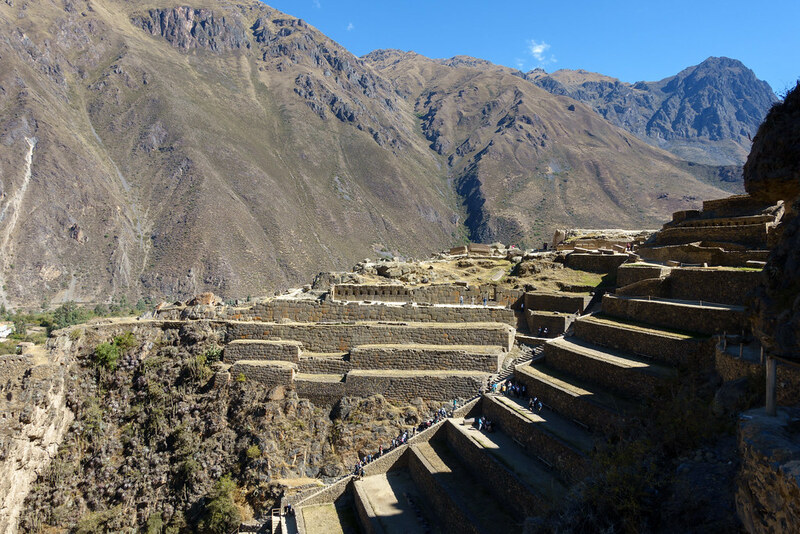 Like at Machu Picchu, there are official guides at the bottom of the hill who you can pay to give you a guided tour around the site. We chose to explore the ruins by ourselves, and I still found the ruins really interesting despite knowing little about them other than the buildings’ names (no other information is provided). There are enough paths, buildings, nooks and lookouts to keep you occupied for well over an hour. 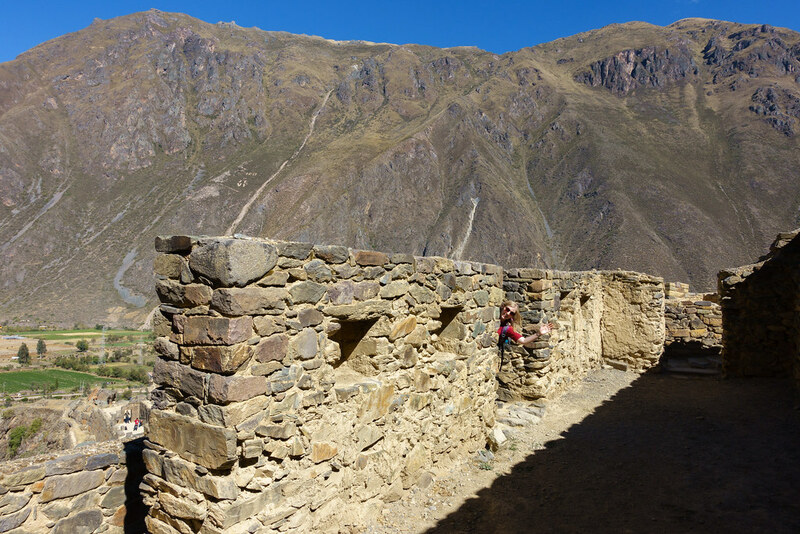 We spent about two hours exploring the Fortress then caught a Collectivo (a minibus taxi) to Cusco for 10 soles each. 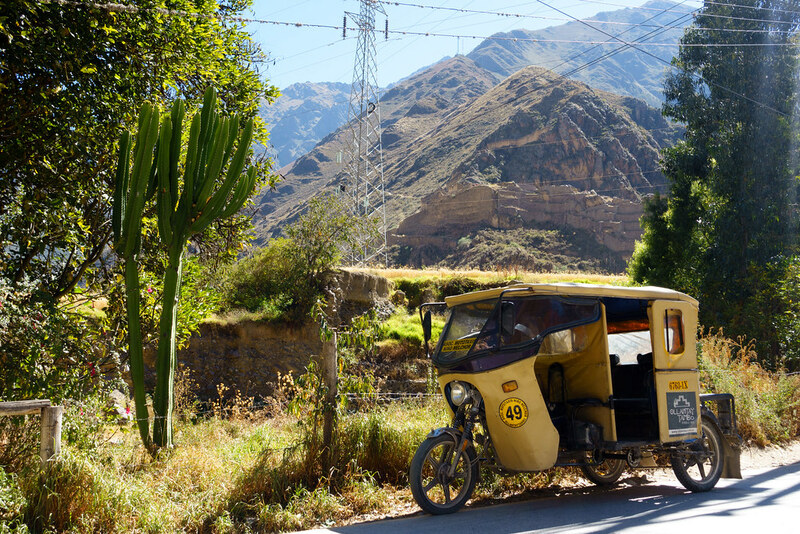 I think these are the best way to get back to Cusco if you don’t already have the journey booked through a Machu Picchu booking, as they are safer and easier to figure out than the local buses, and significantly cheaper than a taxi. 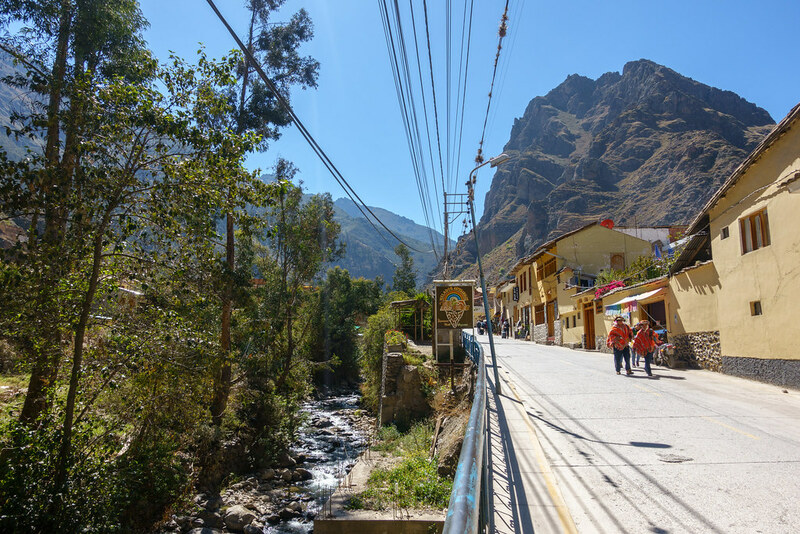 To get a Collectivo, go to the train station at the time a train is scheduled to arrive (there are timetables at the two companies’ ticket offices) and look for the people in blue shirts offering those leaving the train station minibuses to Cusco. Prices they offer seem to vary between 12 and 8 soles, so listen to what they’re offering before accepting the ride. The journey back took us around two hours; I think it would have been faster if it weren’t for the Corpus Christi festival. 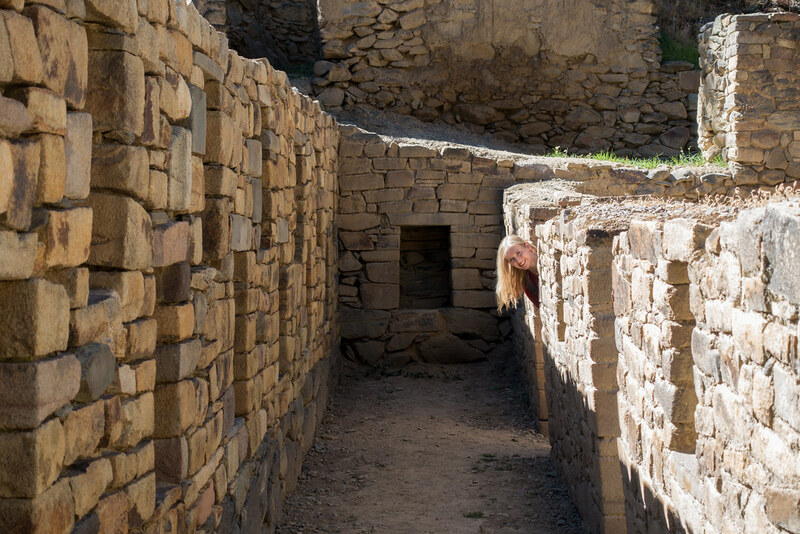 My next post, on Cusco, will describe what we saw at the festival and how we entertained ourselves in Cusco before moving onto our next destination. Subscribe to this blog or like and follow Roam with Juliet on Facebook to be notified when the next post goes live. 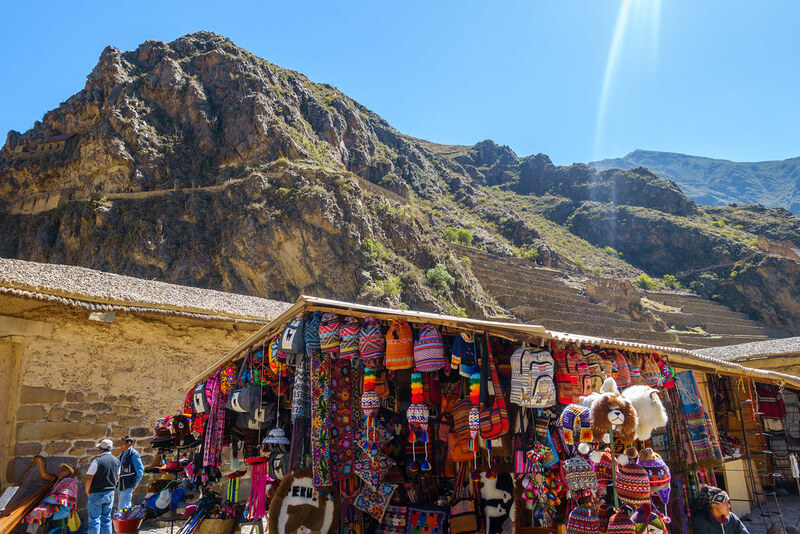 Posted in Peru, Photography, South America, TravelTagged Collectivo, Ollantaytambo, Sacred Valley, Sunshine CafeBookmark the permalink.